Small - $93.99 Only 2 left! Medium - $93.99 Only 2 left! Has your girl ever dreamed of being whisked away to a castle filled with talking candelabras, clocks and tea cups, where she can read all the books she likes? 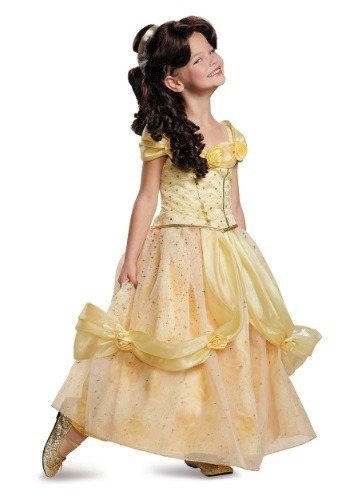 Then, chances are, your kid is a huge fan of Beauty and the Beast and we want to help her achieve her dreams! We don't know any princes that are cursed, or where she can find a castle filled with talking a objects, but we know where to find the perfect outfit for her dream to come true. This Child Ultra Prestige Belle Costume has the golden style of dress seen in the Disney classic animated film! The costume has shimmering sparkles designed into the dress for a vibrant look that will have your girl feeling like an elegant princess in no time. It's truly a look that could charm the heart of any cold-hearted Beast! Just watch out for that Gaston!